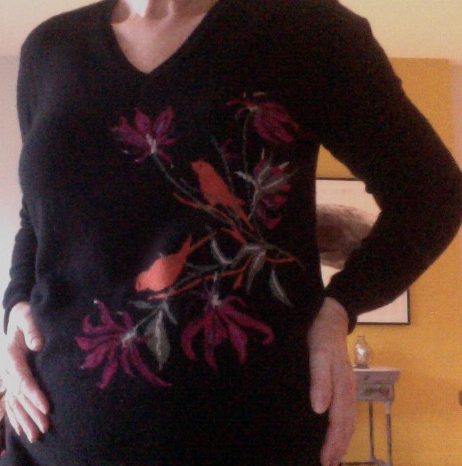 This post is a response to Frugal Scholar's request to see those old cashmere sweaters. She was curious about what styles would go the distance. Easy: the sturdy, bread and butter classics, but also a few less-obvious choices. Below, four oldies. Around 16 years old; people still ask where I got it. Each fall Bompard offer an intarsia, this model was heavily influenced by a Ballantyne bird pattern of that time. EB banished the birds; I wonder if Ballantyne went after them. This year's entry is the landscape jacket. Intarsias can make the wearer look big as a billboard. Because the pattern on this one is placed to the side and the body is black, that effect is minimized. An all-over argyle (which is an intarsia too) doesn't do those of us with size or a bust any favours either. I chose this colour to light up a dreary Canadian winter and it has–for 23 years! Almost shocking pink in the photo, it's really darker, a true, rich rose. It's been invisibly mended by the wizards at Cheeseworth in Toronto (they offer mail service) and I can neither remember nor see the area. I've bought M02 every few years for decades. Wear it as a top (shown), open over a shirt or dress and as a spring jacket. Handy pockets, too. Shown with navy lambskin stovepipes, a simple pull-on pair made by Izzy Camilleri. Pattern was a pair of old Agnès b. pants; these are about 17 years old. A gift from Dad, ca. 1990; I can see him still, assessing the yarn with a deft rub of his fingers, which he'd do even with strangers, stroking a coat or sweater sleeve and saying "Ahhh, nice!" I wouldn't have chosen royal blue, but can see in the photo how it brings out my eyes. Dad liked blues, maroon and a clear, vibrant daffodil yellow on "his girls"– never pastels. The knit's quite a fine gauge; one cuff is mended. I wear it gently, hoping to keep it forever. The earrings are Tiffany bees ca. 1970, from my mother. When "Marina" was visiting last summer we discovered we both had sweaters from 1982! Mine was bought in Paris, while traveling with a boyfriend. It was pricey ($1,150 in today's dollars). Boyfriend was not around to dissuade me; he had bought a sax and honked away under the bridges. Sometimes young, heedless and in love (with the sweater, that is) has its own logic. In fine condition still, it never pilled and somehow the moths didn't hit it. I've removed that Diamond Jubilee scarf to show the bateau neckline. Grabbing these shots, I realized how good-quality old clothes lend comfort and familiarity, and I'm no longer apt to replace something just because I've "had it for ages". There is a time to dismiss the worn-out and dated, but there's also the particular pleasure of pulling out a favourite for another season. What are your favourite long-owned items? I have a long Burberry trench coat from 1986. It has a wool zip out lining. I bought it to wear on a January trip to London. I don't wear it a lot in Dallas, but it comes it handy when we travel to cold places in the wintertime (Boston, NYC, Chicago, Oxford) . There is no need for really warm coats where I live, so it is good to have a timeless coat which will keep me warm most anywhere as long as I wear layers underneath. I have a mid-calf length camel tweed, raglan sleeve coat from Talbot's circa 1995. It feels like a blanket and is toasty warm. This year I will have it relined. The lining has been repaired. It is my comfort coat when the weather here is frosty. I have a black leather moto jacket bought in 1985. I remember it was $600 at the time, and the most expensive purchase, by far, I had ever made for clothing. It's still my favorite leather jacket and has gotten even better with age. Lovely sweaters, with wonderful memories attached to them. OMG that last tunic. I made grabby hands at the screen. Gorgeous. I thrifted a 50´s reversible evening coat in the early 90´s (for only a handful of dollars) and since I live in a place that is potentially cold even in the summer, it was a surprisingly useful find. It has the weight of good quality, and being black, it makes a fine silver brooch look like a piece of art. I´m always warm and elegant in it. Nothing as old as yours, although my Linda Lundstrom long LaParka is around 20 years now. I only wear it in the deepest winter, when it's a great comfort, if a bit dramatic. Next up would be shoe I bought in Quebec City 12 or 15 years ago, that still get out a few times a year -- a tooled leather, round-toed, 3.5 inch stacked heel T-strap/Oxford that I absolutely love and that never really go out of style, at least not in my eyes. . . Your sweaters are fabulous -- the tunic could be hanging on retail racks this fall! 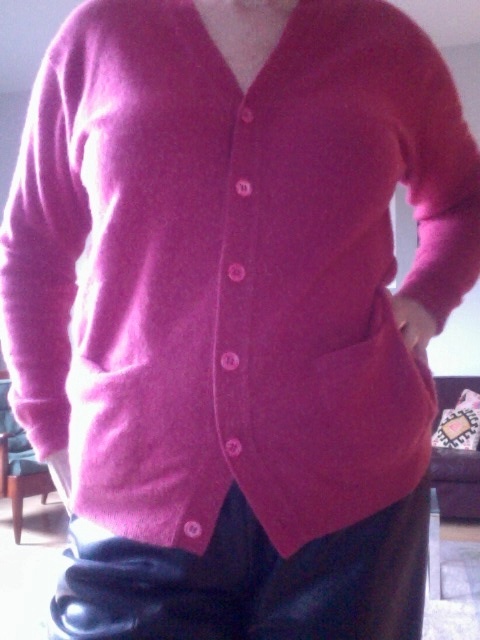 And I never realized how great the Bompard cardi looks worn as a top, buttoned up. Very versatile! Oh, and I love the idea (and what I can see) of those lambskin pants -- fabulous with the cashmere top! Kudos to Swissy for giving away those earrings! I think one of the pleasures of middle age is passing on favorite things to those who will give them another life. Your sweaters are all beautiful and look quite new! Thanks for sharing them. Some of my best oldies were old when I found them. About 20 years ago I bought a rich black 1950s Originala cashmere swing coat with a wide, face-framing hood and sleeves designed to be pushed up over long gloves. It is still the coat I choose for a winter party, because it makes me feel fragile and wrapped-up in a particularly feminine way. It has always interested me how wearing clothing from another era or culture influences one's posture, movement and mood; it seems impossible to be one's ordinary self in them. My other old faithfuls are useful for the opposite reason: they seem to adjust themselves to changes in fashion and figure, allowing me to feel unchanged. In this category I place a black cashmere sweater-shirt which somehow makes me feel slim, comfortable, and appropriately dressed at all times, and a pair of Etienne Aigner cordovan boots--20 years old, re-heeled once, and every bit as practical and beautiful as they were when I bought them. I have a 10-year old Gap corduroy jacket that I've been wearing every fall, winter and spring and it still looks great. I am surprised, because... Gap is not exactly investment dressing, although it felt expensive when I was a grad student! I love the jacket and hope it will last (and fit) forever. Your sweaters demonstrate the wisdom of buying good quality. I love the one your father bought for you, and how lovely to still own and wear his gift. As for me, I have a Burberry purchased in London in 1981, the summer the Prince of Wales married Lady Diana Spencer. For a while it didn't fit, but I'm back into it now. I have a red cashmere sweater set from Saks thar I bought in 1999, I think. I wore the cardigan today. I have multiple pairs of shoes from before 1998, most of which I've had re-soled, and a few handbags. We moved from Ohio to California in 1998, so I date things pre- and post-move. Susan: Burberry trenches seem the operational definition of longevity! Kristien62: Ahhh! Those were the days, when Talbot's had decent to very good fabrics. OMO they have really lost their way, quality-wise. Kathy Leeds: There are the two icons, the trench and moto, showing their mettle again. But leather looks good even beat up. Ros: LOL! Yes, it drapes beautifully. Viktoria: A personal and particular item; I have nearly always bought formalwear secondhand (or in my 20s made it myself.) It rarely gets worn out. Swissy: A spontaneous gift is one of the most graceful and generous gestures I know of. Consider your cheeks virtually kissed! materfamilias: Good Canadian parka girl! And agree your shoes are forever, they sound like dance 'character shoes', heels but comfortable. That EB model is very versatile. c.: "Where old when I found them" testifies to the quality of fabric and notions then. (Once you hit the era of synthetics, vintage quality drops.) In high school I saved for an Aigner wallet. By the time I wore that one out (end of university) the leather n the new one was half the weight. Now, there is a brand that could revive its quality. Gauss: I'm with you! Have a few Gap heavy cotton tees (nearly sweaters) that wore for many years. I occasionally drop by looking for that quality but it is rare there. 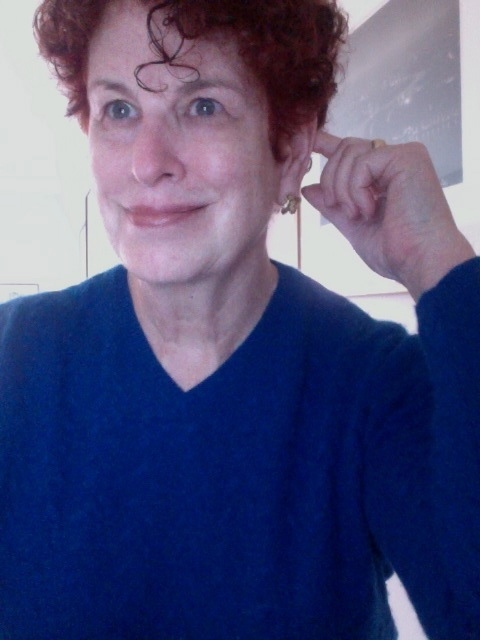 SewingLibrarian: So nice to get into your red cashmere again, congratulations (and IMO feels better than spending it all over again on a new red cardi.) Might a quality purchase be defined as "hurts when you buy it but feels great a decade later?" Wonderful photos of you, BTW. I agree the royal blue is surprising, but also flattering. I keep what lasts:). A Chanel jacket, an Armani jacket, and yes, cashmere sweaters. Bompard has now entered my rotation, thanks to you and Mater. LPC: I remember a beloved TSE sweater of yours that finally wore out. Duchesse, forgot to say that I think you look stunning in the royal blue beloved sweater. And thanks for the salutation! A quilted coat by Diesel, bought about 20 years ago. I't buttoned in the half, so I can wear it shorter or long. Unfortunately Diesel discontinued this versatile piece so I have to fondle it. Of course I like your Intarsia sweater, but this royal blue is wunderbar on you! barbara: What an ingenious design! We can only hope they revive it. What beautiful sweaters. The royal blue is beautiful. How do you keep them from pilling? I have a long black ribbed cashmere cardigan given to me by MIL in 1986. It is a bit thinner but still in remarkably good condition considering I wear it constantly. A few cashmere sweaters from the 90s are still hanging around. There is also an Issey Miyake wool tuxedo jacket with pleated sleeves (those are poly-blend) from the early 90's and a gray coat from 1998 that I fit into again. A few other pieces I think. A belated thank you for this. If only we could look into the future and see which purchases will be the great ones. "...a well-made cashmere product should feel soft and this should get better and softer as the piece is worn and washed. If it is too soft in the shop, it will pill and deteriorate rapidly. A good indication is to hold the cashmere piece up at eye level and look along the top surface. There should be a fuzziness above the fabric. If it is around 1mm then it should be fine - anymore and it will pill with minimal use." Pills are born in that fibre processing process, then show up when something (the body, a jacket,a chair) rubs the garment. There is no way to keep a poorly-processed yarn from pilling. And high-priced sweaters are not a guarantee. I pull them off gently by hand (never a sweater stone, which shortens the fibre further); washing also decreases visible pills but not 100%. Mostly, I seek the 'dryer, flatter' hand of the Scottish type cashmere instead of the 'melting butter' hand of Italian product, at least for sweaters. Mardel: A good poly-blend like your Miyake is practically indestructible; I have a vintage Halston evening jacket like that. frugal: IMO, we *can* choose items for longevity (after some experience and analysis)- but the culture sends us the opposite message: keep buying new stuff! Thanks for asking the question. I'm visiting you from Une Femme/Sue and am so happy to meet you. She, of course, has made it sound as if I've missed quite a lot by not knowing you...so I'm about to fix that !! Splenderosa: Welcome, and thank you! With over 775 posts to date, there's much to get to know.